After five years of study at Blue Ridge Tae Kwon Do, today I earned my black belt. It’s been a long and rewarding journey as Cameron and I studied with Master Tony Horkan at his dojang in Upperville, Virginia. As part of my test, I wrote this paper and read it aloud to all the students and families attending the black belt testing. Although I didn’t take the photograph above (thank you Sam! ), I made an exception to be in the photo because this was an exceptional day. No one really bothered me as a child, but I’d thought about how cool it would be to know that if someone did I’d have the ability to do something about it. With my focus on other sports, though, I never had the opportunity to pursue martial arts, and as those long-ago TV commercials faded away so did my thoughts about Tae Kwon Do. Well, that day did arrive, about a decade later, and wouldn’t you know, I stepped through the doorway holding the hand of a 7-year-old boy who wanted to try Tae Kwon Do. 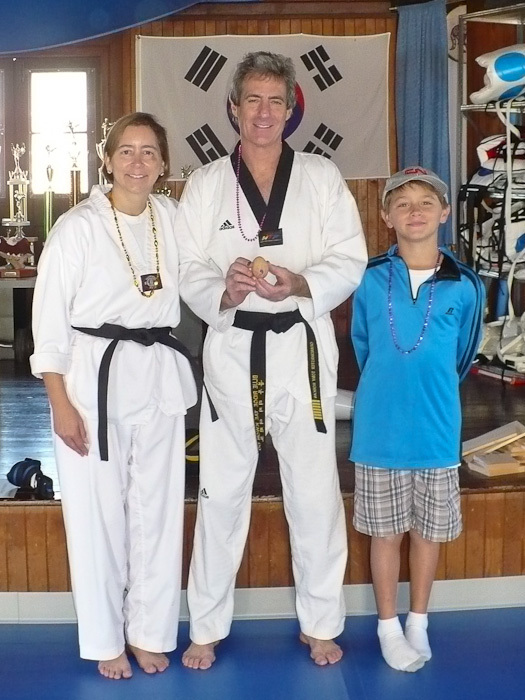 As many of you know, Cameron, now a 1st Dan black belt, loved Tae Kwon Do from the start. As I sat on the sidelines watching him enthusiastically learn 10-step No. 1, I thought, “Why am I just sitting here?” And, thankfully, just as I was trying to get up the nerve to talk to Master Horkan about starting lessons myself, the Herron family arrived. With Kimber and Monica by my side as adult moral support, I began my long-awaited Tae Kwon Do experience. Many of you who’ve been involved in Tae Kwon Do here at Blue Ridge have heard the wonderful and inspirational papers read by the black belt leaders of our dojang. I’ve laughed and cried right along with them as they spoke about their journeys from white belt to black and beyond; how Tae Kwon Do has changed their lives through instilling confidence and self-respect. It’s all true and then some. Over the past four years, Cam and I have spent hundreds of hours here in this room together, growing in our knowledge, skills and self-assurance as we moved up in the levels. Like all students, we’ve struggled at times. But having each other to lean on has helped carry us toward our goals. When I have trouble learning a new form or a kick, Cam is here to help me out, and when he would like nothing better than to head straight home after school, I’m here to convince him to attend class (and, if necessary, an ice cream sandwich from the Upperville Country Store is good bribery). Of course, I never could have accomplished this goal without support, including my husband Gary and Masters Horkan, Kidder, Moore, Bauch and Du Chen, along with the many other students of all levels who’ve helped me along the way. Achieving my black belt with Cameron by my side is something I’ll cherish forever. It’s not many parents who have the opportunity to take a journey such as this with their child, creating a bond strengthened by the Tae Kwon Do tenants of honesty, courtesy and respect. But it’s not really the color of the belt I’m wearing that matters to me. It’s that for the past five years we’ve stood side-by-side here, embarking on a journey in life and in sport that has only just begun. When I first became aware of Tae Kwon Do through the Jhoon Rhee commercials, I thought of it as a way to keep people away, as they emphasized: “Nobody bothers me.” But, in reality, Tae Kwon Do is all about joining people together. It’s a place we all come to learn, to have fun, to support one another and, most importantly, to become friends. It’s also a place where Cameron and I have become more than mother and son. I am impressed. Great accomplishment–and fun to have this relationship with Cam. Thank you so much! Yes, Cam is a great mentor in Tae Kwon Do! Congratulations Tricia!!! This was a joy to read! Thank you, David! I truly appreciate your comment!